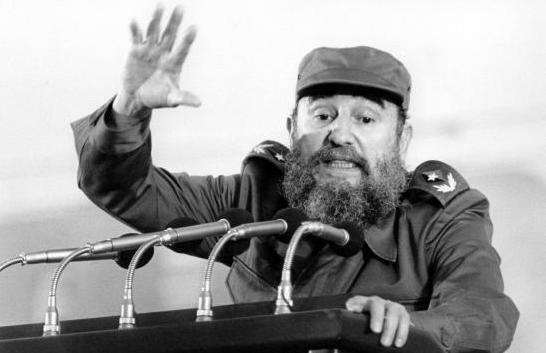 Cuba's revolutionary leader Fidel Castro has died aged 90. To celebrate the life of this remarkable figure in history, we present a selection from his four-hour speech, 'History Will Absolve Me'. In October 1953, Castro defended himself in this speech in the courts after he led the attack on the Moncada Barracks. Later, the speech was reconstructed as the manifesto for Movimiento 26 de Julio and overthrowing Batista's dictatorship. 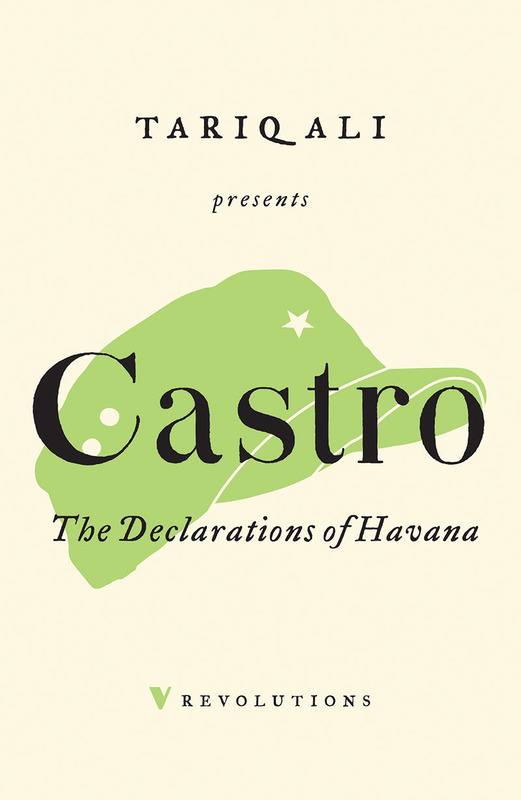 This speech is but one in the collection The Declarations of Havana, part of our Revolutions series with an introduction by Tariq Ali. Let me tell you a story. Once upon a time there was a republic. It had its constitution, its laws, its civil rights, a president, a congress and courts of law. Everyone could assemble, associate, speak and write with complete freedom. The people were not satisfied with the government officials at that time, but they had the power to elect new officials and only a few days remained before they were going to do so. There existed a public opinion both respected and heeded and all problems of common interest were freely discussed. There were political parties, radio and television debates and forums and public meetings. The whole nation throbbed with enthusiasm. This country had suffered greatly and although it was unhappy, it longed to be happy and had a right to be happy. It had been deceived many times and it looked upon the past with a real horror. This country blindly believed that such a past could not return; the people were proud of their love of liberty and they carried their heads high in the conviction that liberty would be respected as a sacred right; they felt confident that no one would dare commit the crime of violating their democratic institutions. They desired change for the better, aspired to progress; and they saw this at hand. All their hope was in the future. Poor country! One morning the citizens awakened dismayed; under the cover of night, while the people slept, the ghosts of the past had conspired and had seized the citizen body by the limbs . . . by its very throat. That grip, those claws were familiar: those jaws, those death-dealing scythes, those boots. No; it was no nightmare; it was a sad and terrible reality: a man named Fulgencio Batista had just perpetrated the appalling crime that no one had expected. “Whosoever shall perpetrate any deed destined through violent means directly to change in whole or in part the Constitution of the State or the form of the established government shall incur a sentence of six to ten years' imprisonment. A sentence of three to ten years' imprisonment will be imposed on the author of any act directed to promote an armed uprising against the Constitutional Power of the State. The sentence increases from five to twenty years if the insurrection is carried out. Whosoever shall perpetrate an act with the specific purpose of preventing, in whole or in part, even temporarily, the Senate, the Chamber of Representatives, the President or the Supreme Court from exercising their constitutional functions will incur a sentence of between six and ten years' imprisonment. Whosoever shall attempt to impede or tamper with the normal course of general elections will incur a sentence of four to eight years' imprisonment. Whosoever shall assume command of troops, posts, for- tresses, military camps, towns, warships or military aircraft, without the authority to do so, or without express govern- ment orders, will incur a sentence of five to ten years' imprisonment. Without telling anyone, the Code in one hand and a deposition in the other, that citizen went to the old building in the capital which housed the competent court which was under obligation to bring cause against and punish those responsible for this deed. He presented a writ denouncing the crimes and asking that Fulgencio Batista and his seventeen accomplices be sentenced to 108 years' imprisonment as decreed by the Code of Social Defence, considering also the aggravating circumstances of second offence, treachery and acting under cover of night. Days and months passed by. What a disappointment! The accused remained unmolested; he strode up and down the country like a great lord and was called Honourable Sir and General; he removed and replaced judges at will. The very day the Court opened, the criminal occupied the seat of honour in the midst of our august and venerable patriarchs of justice. Once more the days and the months rolled by, the people wearied of mockery and abuses. There is a limit to tolerance! The struggle began against this man who was disregarding the law, who had usurped power by the use of violence against the will of the people, who was guilty of aggression against the established order, and who tortured, murdered, imprisoned and prosecuted those who had taken up the fight to defend the law and to restore liberty to the people. Honourable Magistrates, I am that humble citizen who one day demanded in vain that you punish the power-hungry men who had violated the law and torn our Constitution to shreds. Now that it is I who am accused, for attempting to overthrow this illegal regime and to restore the legitimate Constitution, I am held for seventy-six days and denied the right to speak to anyone, even to my son; between two heavy machine guns, I am led through the city. I am transferred to this hospital to be tried secretly with the greatest severity; and the Prosecutor, with the Code in his hand, solemnly demands that I be sentenced to twenty-six years in prison. You will answer that on the former occasion the courts failed to act because force prevented them from doing so. Well then, confess: this time force will compel you to condemn me. The first time you were unable to punish the guilty; now you will be compelled to punish the innocent. The maiden of justice twice raped. And so much talk to justify the unjustifiable, to explain the inexplicable and to reconcile the irreconcilable! The regime has reached the point of asserting that 'Might makes Right' is the supreme law of the land. In other words, that using tanks and soldiers to take over the presidential palace, the national treasury and the other government offices, and aiming guns at the heart of the people entitles them to govern the people! The same argument the Nazis used when they occupied the countries of Europe and installed their puppet governments. I heartily believe revolution to be the source of legal right; but the nocturnal armed assault of 10 March could never be considered a revolution. In everyday language, as José Ingenieros said, it is common to give the name of revolution to small disorders promoted by a group of dissatisfied persons in order to grab, from those in power, both the political sinecures and the economic advantages. The usual result is no more than a change of hands in the dividing up of jobs and benefits. This is not the criterion of a philosopher, as it cannot be that of a cultured man. Leaving aside the problem of integral changes in the social system, not even on the surface of the public quagmire were we able to discern the slightest motion that could lessen the rampant putrefaction. The previous regime was guilty of petty politics, theft, pillage and disrespect for human life; but the present regime increased political skulduggery fivefold, pillage tenfold, and has increased a hundredfold the lack of respect for human life. It was known that Barriguilla had plundered and murdered, that he was a millionaire, that he owned a good many apartment houses in Havana, countless stock in foreign companies, fabulous accounts in American banks, that he distributed capital gains to the tune of eighteen million dollars, that he was a frequent guest in the most lavishly expensive hotels for tycoons. No one would ever accept that Barriguilla was a revolutionist. Barriguilla was like that sergeant of Weyler's who dispatched twelve Cubans in El Guatao. Batista's men murdered seventy in Santiago de Cuba. De te fabula narratur. Four political parties governed the country before 10 March: the Autentico, Liberal, Democratic and Republican parties. Two days after the coup, the Republican party gave its support to the new rulers. A year had not yet passed before the Liberal and Democratic parties were again in power. Batista did not restore the Constitution, did not restore civil liberties, did not restore Congress, did not restore universal suffrage, did not restore in the end any of the uprooted democratic institutions. But he did restore Verdeja, Guas Inclán, Salvito García Ramos, Anaya Murillo and the top hierarchy of the traditional government parties, the most corrupt, rapacious, reactionary and antediluvian elements of Cuban politics. This was like the 'revolution' of Barriguilla. Lacking the most fundamental revolutionary content, Batista's regime represents in every aspect a twenty-year regression for Cuba. Batista's return has exacted a high price from all of us, but primarily from the humble classes which are suffering hunger and misery. Meanwhile the dictatorship has laid waste the nation with agitation, unfitness and anguish, and now engages in the most loathsome forms of ruthless politics, concocting formula after formula to perpetuate itself in power, even if over a stack of corpses and a sea of blood. Batista's regime has not set in motion a single nationwide programme of betterment for the people. Batista delivered himself into the hands of the great financial interests. Little else could be expected from a man of his mentality - utterly devoid, as he is, of both ideals and principles and utterly lacking the faith, confidence and support of the masses. His regime brought merely a change of hands and a redistribution of the loot among a new collection of friends, relatives, accomplices and parasitical dregs that constitute the political retinue of a dictator. What great shame the people have been forced to endure so that a small clique of egotists, altogether indifferent to the needs of their homeland, may find in public life an easy and comfortable modus vivendi. How right Eduardo Chibás was in his last radio speech, when he said that Batista was encouraging the return of the colonels, of castor oil, and the Fugitive Law. Immediately after 10 March, Cubans began once more to witness such acts of veritable vandalism they had considered banished for ever from Cuba. There was an unprecedented attack on a cultural institution: the radio station CMQ was stormed by the thugs of the SIM, together with young PAU hoodlums, while broadcasting the 'University of the Air' programme. There was also the case of Mario Kuchilán, dragged away from his home in the middle of the night and bestially tortured till he was nearly unconscious, and the murder of student Rubén Batista, and the criminal volleys fired at a peaceful student demonstration next to the wall where the Spanish volunteers shot the medical students in 1871. And many cases such as that of Dr García Bárcena, when even in the courtrooms men have coughed up blood because of the barbaric tortures practised upon them by the repressive security forces. I will not enumerate the hundreds of cases where groups of citizens have been brutally clubbed - men, women, children and the aged. All of this was being done even before 26 July. Since then, as everybody knows, Cardinal Arteaga himself was not spared such treatment. According to the official story, he was the victim of a 'band of thieves'. For once the regime told the truth. What else is it?